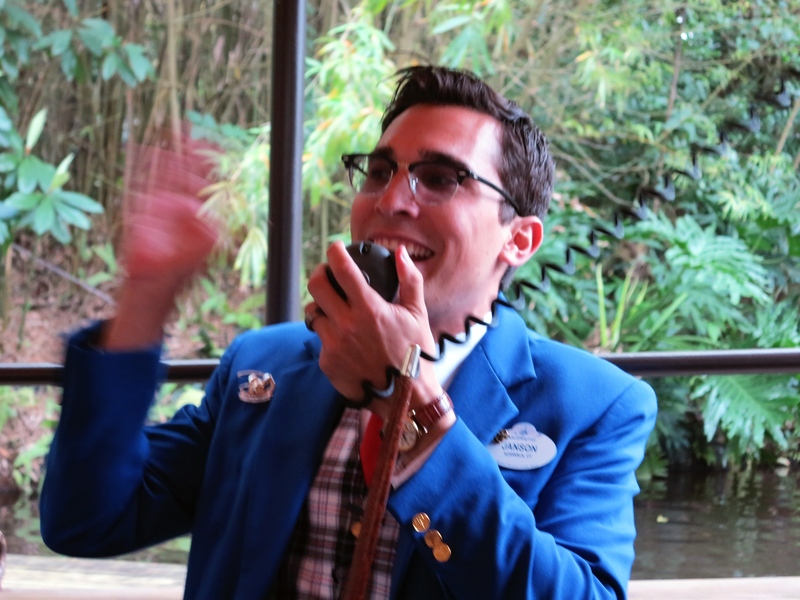 Some of the best times I’ve had at Walt Disney World have been on the tours that Disney offers. I’ve done several and have thoroughly enjoyed them all. I can’t wait for the next one. In the meantime, let me tell you about the Keys to the Kingdom tour that I did in January. 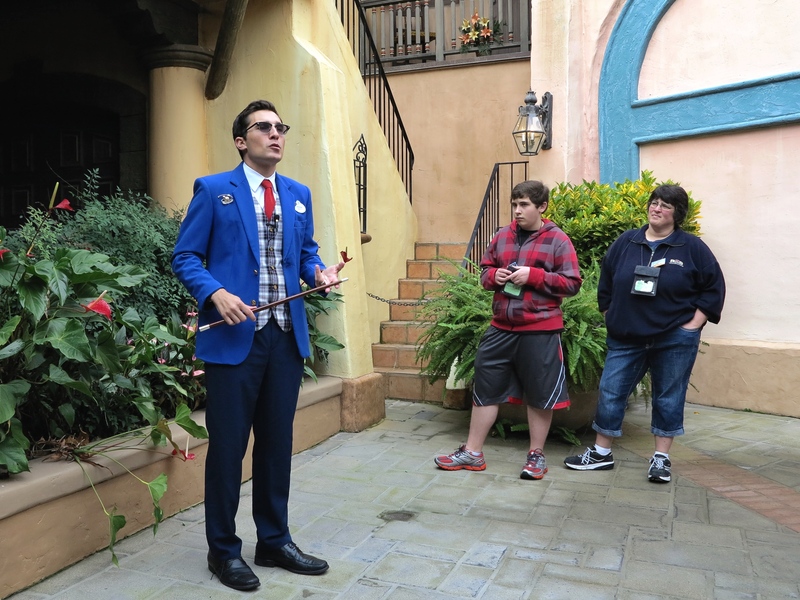 Keys to the Kingdom is a walking tour that takes place in the Magic Kingdom. It’s about 5 hours long and we were on our feet for most of the time. By the end, I was feeling a little tired, but the content was so interesting that the time really flew. When you do a tour at one of the parks, sometimes they begin before the park even opens. In fact, that’s my favorite time to schedule a tour because it gives you a chance to enter the park before anyone else. No matter whether it’s your fist time at Walt Disney World or whether you’re a seasoned Guest, getting to enter a park before it’s actually open is very exciting. My tour started at 8:30 a.m. so I arrived at 8:15 and went to the turnstile at the far left and let them know I was there for a tour. 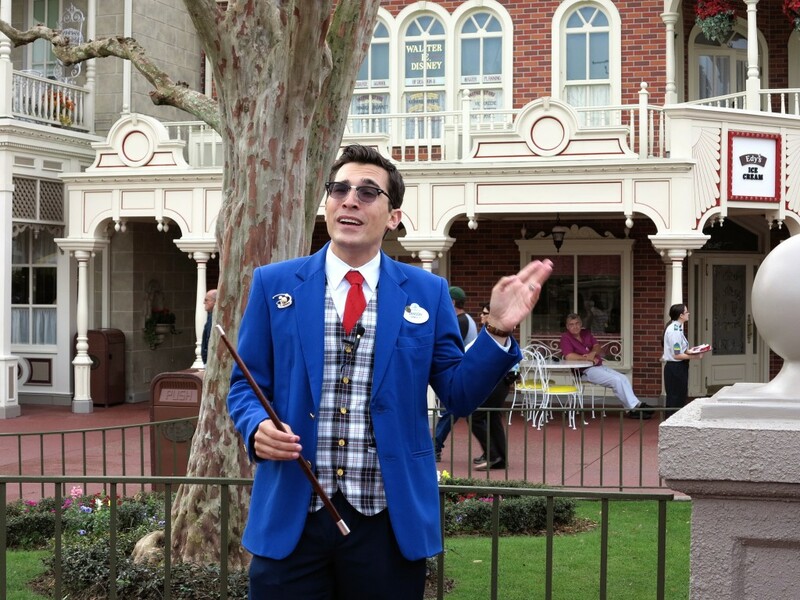 They directed me to the Chamber of Commerce building, adjacent to City Hall, where Cast Members were ready for us with nametags and listening devices. The listening devices are great – you can easily hear everything your tour guide has to say, even if you’re 20 feet away. 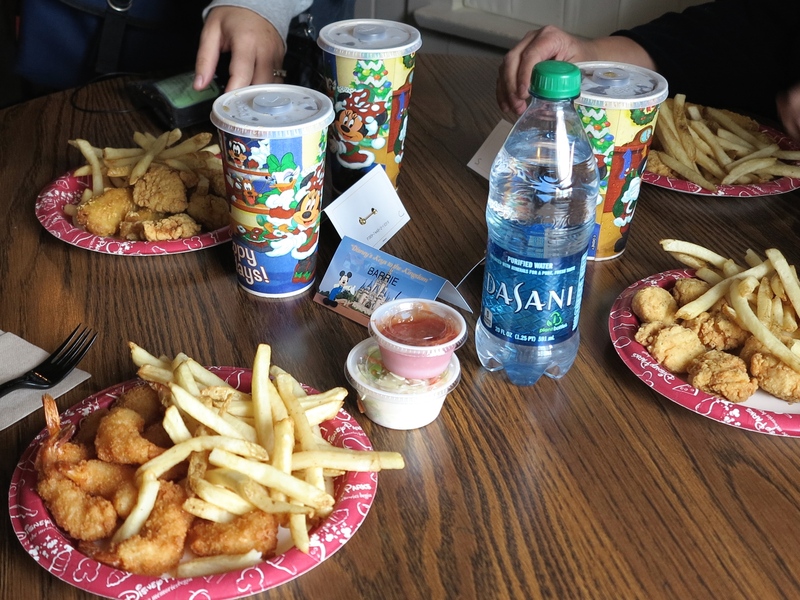 Lunch at Columbia Harbor House is included on this tour and we were able to choose what we wanted from an abbreviated menu – I ordered the shrimp. On my way out to wait for the tour to start I was offered bottled water to take with me, which I thought was a very nice touch. Our tour guide was a nice young man from Connecticut named Janson. I was really impressed with how much he knew and how easily he spoke. Five hours is a long time to fill and Janson did it effortlessly, easily keeping us all entertained while he filled us with interesting facts and anecdotes about the Magic Kingdom and Walt Disney. 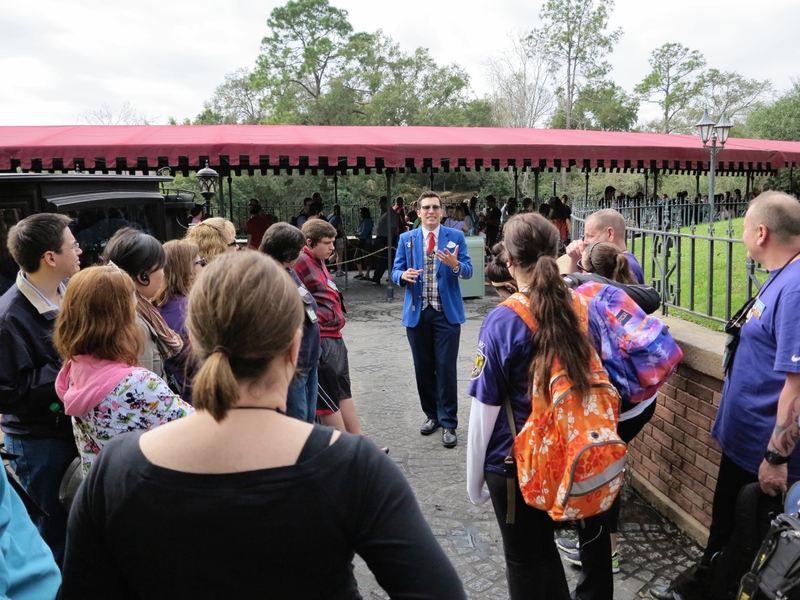 Having been around the Disney community for several years, I figured that much of what we would hear on this tour would be things that I had heard or read before. I’m happy to say I was pleasantly surprised by how much of what Janson shared that was new to me. Some of the people on the tour were doing it for the second time and they said that they picked up a lot of new information this time around. The tour began in front of City Hall where Janson explained what the Keys of the Kingdom are. In order of importance, they are Safety, Courtesy, Show and Efficiency. Throughout the tour, we were given examples of how the keys are woven into every detail of the design and operation of the park. From something as simple as how the color of the pavement changes to show a change in grade (safety) to how the entrance is designed to build anticipation by hiding what’s inside until you pass through the portals on either side of the train station – as if a curtain has been pulled back to let Guests onto the stage (show). 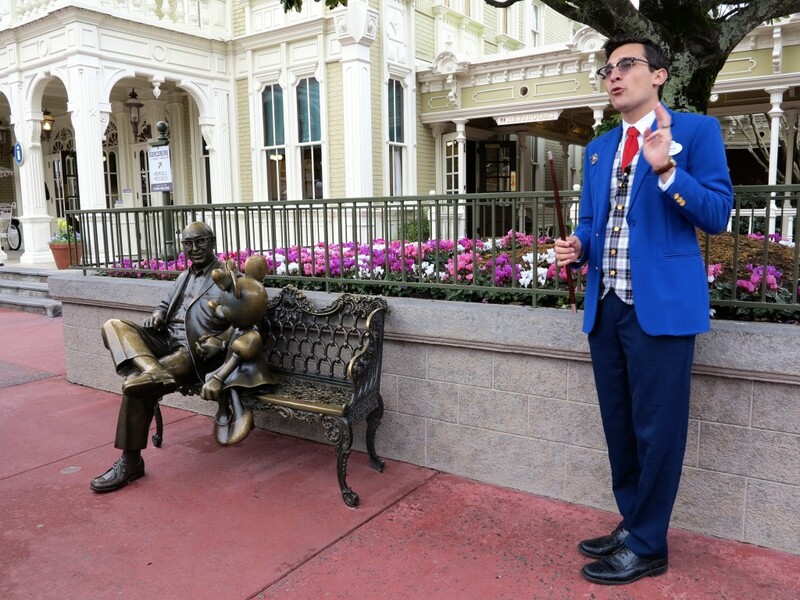 Outside of City Hall is also where we first heard mention of Walt Disney and his brother, Roy Disney, and the important role they both played in the creation of this magical place. From here we moved onto Main Street where Janson made note of the names on the windows above the shops and explained the meaning behind several of them. He also talked about how the buildings were designed using forced perspective, a trick to make them feel larger than they actually are. 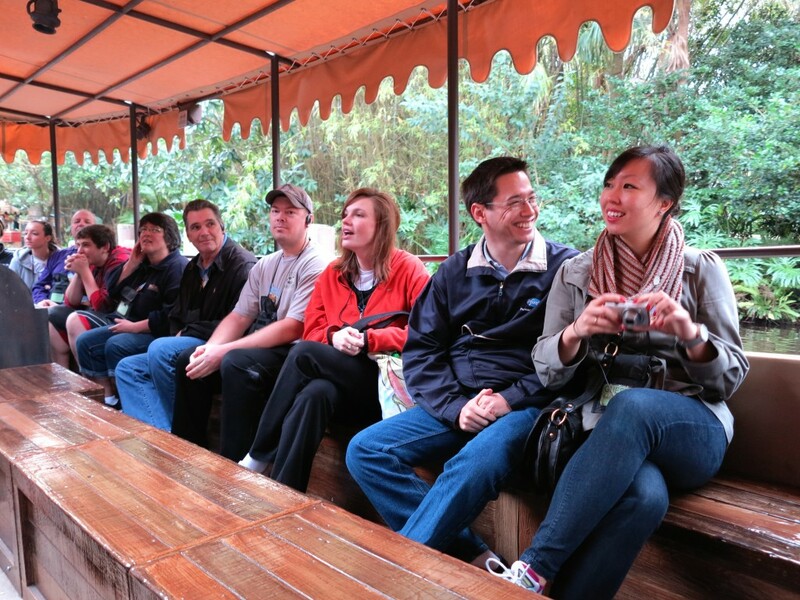 Next we made our way to Adventureland, where we took a ride on both Jungle Cruise and Pirates of the Caribbean. We didn’t have to wait in line for either one and throughout the rides Janson shared little known facts about each of the attractions. After leaving Pirates, we headed back stage to an area behind Splash Mountain. For some, seeing where the trash is collected and where the parade floats are stored could put a damper on the magic. For me though, this was one of the most interesting parts of the tour. I loved getting a peek behind the scenes to see how things work. There is no photography allowed back stage so, unfortunately, I don’t have any pictures to share with you from this area. By now, it was getting close to lunchtime and we made our way through Frontierland to Liberty Square. Along the way we learned about the theming of each of the lands and the length Disney goes to maintain the theme in every detail. 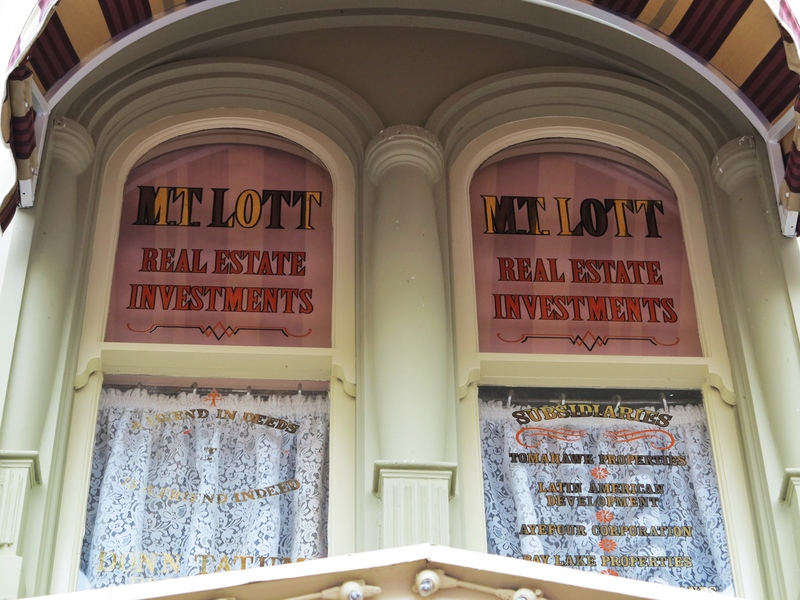 For example, have you ever noticed that there are no restrooms in Liberty Square? That is because they didn’t have plumbing back then. I did find it interesting that as we neared the restaurant, the new Rapunzel’s Tower was awkwardly visible behind it. I don’t think you would have seen that in Colonial New England back in the day. Knowing Disney, they will find a clever way to disguise it. When we arrived at Columbia Harbor House we went straight upstairs to a private area where our food was ready and waiting for us. The tables were set up with name placards by our plates and inside the placard was a commemorative pin for the tour. It was nice to sit for a little bit and chat with others in the group. Refreshed and nourished, we headed to the Haunted Mansion next. Janson took us through a “secret” entrance, used by VIPs and Guests with mobility issues. Once again, we bypassed the line. Being a VIP is fun! 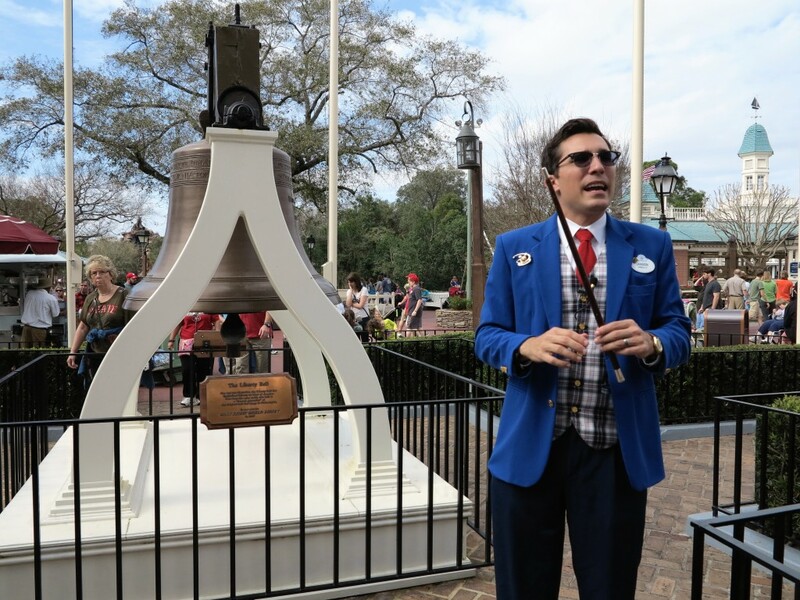 Before and after the ride, he spent time sharing all kinds of facts and trivia about the attraction. Before leaving Liberty Square, Janson told us about many of the details in this land. I was most impressed by the Liberty Tree which, as a full grown tree, was actually moved to its current location from somewhere else on property. It was a difficult accomplishment and a testament to the determination of the landscaping crew, who has a logo of the tree on their uniforms to remind them that they can do anything they set their minds to. When I signed up for this tour, I was most excited about getting the chance to see the Utilidors. We have finally reached that part of the tour! 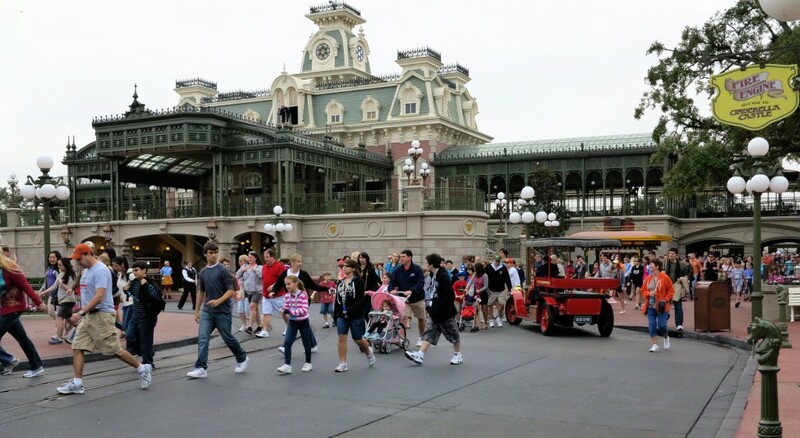 Many people do not realize that below the Magic Kingdom is a tunnel system used by Cast Members to travel from one part of the park to another, unseen by Guests. The Utilidors also house such operations as plumbing, electric, garbage removal, the computer system, and Cast Member services. It was a real treat to see firsthand what they were like. Now, remember, this was a 5-hour tour. It was jam-packed with interesting information throughout. I have barely touched on what we experienced and deliberately shared only a tiny bit so as not to spoil it for anyone wanting to take the tour themselves. I give this tour a giant thumbs up! Janson was great and everything about the tour was top-notch. In fact, I’m pretty certain that I’ll be going again. I know that, depending on your guide, the information may be slightly different from one tour to the next. But even if it was exactly the same, it would be worth repeating just because it’s impossible to absorb it all in one shot. If you’re interested to take the tour, call (407) WDW-TOUR of (407) 939-8687 to make reservations. The price is $78.81 with tax, plus park admission. There are discounts available for annual passholders, AAA members and DVC members. You must be at least 16 years old for the tour. Be sure to wear good walking shoes and have a great time! 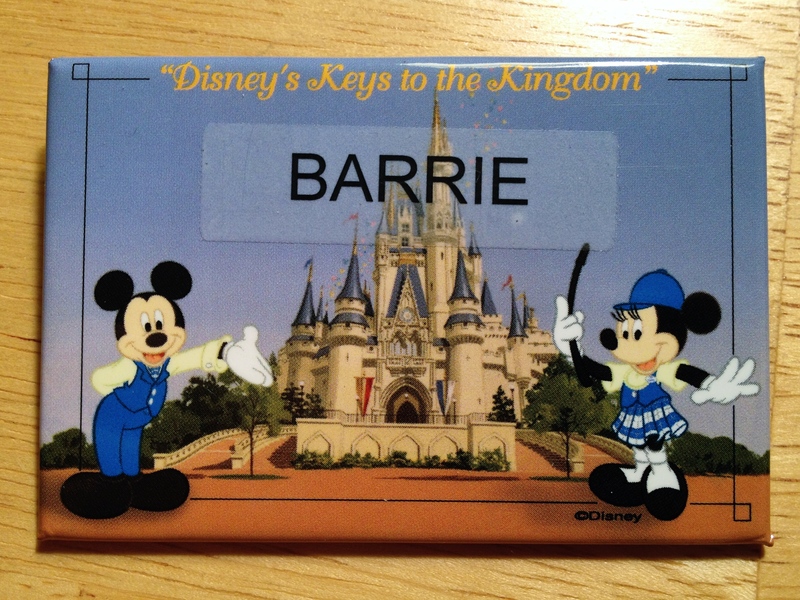 3 thoughts on "Disney’s Keys to the Kingdom Tour"
Thanks Barrie. Our group is doing the tour in August. What rides did you get to go on, and what did they feed you at Colombia House? Thanks so much for sharing your thoughts on this tour. My daughter and I have reservations to do this tour in May, and we weren’t 100% sure what to expect as there’s very little information actually offered online. I appreciate seeing that you are able to take SOME pictures (just not of the behind-the-scenes stuff) – that makes me happy!